The Bills will be facing their most accurate kicker in team history this Sunday, as Rian Lindell will be kicking for Tampa Bay on Sunday, but the veteran kicker is anything but bitter about moving on from Buffalo this past summer. Lindell was released by the team when they chose to go with sixth-round draft pick Dustin Hopkins as their place kicker. Hopkins then suffered a groin injury five days before the season opener and Dan Carpenter has kicked for the Bills ever since. An 83 percent kicker with the Bills, Lindell has struggled of late, with four misses in his last three games, but he has no problem the decision the team made to release him during final cuts. As we covered on Buffalobills.com today, kicker Dan Carpenter has a chance to set the Bills single season mark for field goal accuracy. Here’s how close he is. If he is successful on his next field goal attempt he will tie Lindell’s single-season percentage mark set back in 2006. Knowing it’s likely to come in the next game, he’ll have the advantage of kicking indoors with Buffalo’s next home game at the Rogers Centre in Toronto so weather will not be a factor. Releasing a player is never easy, especially one who is the longest tenured player on Buffalo’s roster. Parting ways with Rian Lindell Monday was a difficult thing for head coach Doug Marrone, but not just because the kicker was a reliable player and model professional. It was also difficult because when Marrone met with Lindell early this morning, he remembers what it’s like to sit in the chair Lindell was occupying. Rian Lindell, Buffalo’s latest player release is likely to find a job elsewhere in the league, as he’s still a very capable kicker. With the Bills drafting Dustin Hopkins in the sixth round, however Lindell needed to be perfect to hang onto his job. Lindell was more accurate than Hopkins over the long haul stretching back to the spring practices, but in camp he wasn’t dramatically better than Hopkins. With the investment made in Hopkins, the rookie kicker just had to show progress as camp went along. The only shame was that Lindell was released needing just 32 points to become the Bills all-time leading scorer. Hope everyone had a great 4th with their families and working the grill. Now to your questions from AskChris@bills.nfl.net and on Twitter @ChrisBrownBills as Bills training camp is just three weeks away. CB: Coach Marrone said he’s “open to the idea” of carrying two kickers on his roster. I think the scenario you propose is what could to lead to the Bills carrying a pair of kickers. Lindell has unquestionably been the more accurate kicker through the spring practices. Hopkins had an approach problem on his field goal attempts during team segments and appeared to be over rotating his hips, which leads a kicker to hook a field goal wide left if he’s right-footed or wide right if he’s left-footed. All but one of Hopkins’ misses were hooked left (he’s right-footed). Hopkins intends to correct that in the weeks leading up to camp. If he does that successfully it could quickly make him a major threat to Lindell because Hopkins clearly has more leg than the veteran kicker on kickoffs. Do you expect the Bills to add a 4th QB to the roster just as an additional training camp arm? CB: I would be surprised if the Bills added another arm in training camp at quarterback. Here’s why. First and foremost Buffalo’s coaching staff has to decide on a starter at the position. The more reps they can give Kevin Kolb and EJ Manuel the better position they’re in to make an accurate evaluation and decision. Second, within that competition the most important thing that must happen is someone has to be ready to play come Week 1. Knowing it’s a brand new offense for all three quarterbacks, robbing reps no matter how few, from Manuel and Kolb with a fourth quarterback would be counterproductive. If Kolb and Manuel need to rest their arms a bit more on certain practice days, Jeff Tuel can step in. They don’t need a fourth as I see it. Looks like the Byrd contract could get messy the longer he holds out. It might be crazy, but any chance he gets traded for another quality player? The Bills did draft two safeties in the draft as well as having Aaron Williams switch to the position. And say they did… what position do you think they would trade for? CB: I don’t think we can rule out the potential of a sign and trade, but it should be noted that such an option does not exist as long as he has not signed his franchise tender. The Bills have traded a franchise-designated player before. They did it with Peerless Price when they shipped him to Atlanta in exchange for a first-round draft choice back in 2003. I believe the Bills would prefer to keep Jairus Byrd on the roster long term. Keep in mind there are other options for both sides (e.g. sign one-year tender, wait until end of season to negotiate long term contract, etc.). I don’t want to get too far into the hypotheticals, but in reference to your ‘what would they trade for’ scenario, a proven starting guard couldn’t hurt. 4 – Hi Chris Brown!! Diehard fan in Spokane, WA. Thx for everything you do, without your reporting I would be lost out here! I was wondering how you think Manuel faired overall? Mainly from what I’ve seen is a deep ball here and there mixed in with a couple picks but do you see him as possibly the starting QB this year? How were all the throws we didn’t hear about? More bad or good? Is he picking it up quickly? CB: First off Tony, thanks for the kind words. With respect to Manuel I think there was progress made with his game in the spring practices. I believe that while the myriad of defensive looks he experienced in practice from Mike Pettine’s defense lengthened the learning curve in terms of execution, he’ll benefit in the long run from it because it is a defense that accurately replicates game speed. Where he had trouble was when he had to hurry and get off throws underneath. Sometimes his delivery did not have the proper touch because the throw was rushed. There were instances where the decision he made wasn’t necessarily the best one, but for the most part those were few and far between. Manuel has a lot of good stuff between the ears and did not appear to make repeat mistakes. Again I think the speed and aggressiveness of the defensive scheme he faces every day in practice will be a help not a hindrance in the long run. His physical ability is unquestionable and his deep ball accuracy is impressive. He also has an offensive coordinator that knows how to maximize Manuel’s strengths while minimizing some of his weaknesses due to inexperience. I believe he has a chance to be the starter, but it will largely come down to how much progress he can make in training camp and the preseason games. Just a quick question…I thought new NFL coaches get an extra mini-camp in their first year?? Did I miss the extra camp or is that no longer a rule? CB: You are correct new head coaches do get an additional spring camp with their players. Coach Marrone held a voluntary veteran minicamp the week before the draft (April 15-18). Rian Lindell was sent out to attempt a 52-yard field goal with 12:34 left in the game and the Bills up 12-7. A timeout was called before the attempt was made, and ultimately Shawn Powell was brought on to punt. Lindell and Chan Gailey were both asked about the turn of events that led to the decision to punt. The coverage unit did down Powell’s punt at the five-yard line and a penalty pushed them back to the three. The Rams did get out of their own end on the possession to their own 37 before punting. Lindell was asked about not getting the chance to make an attempt from 52 when the timeout was called. When asked about appearing upset on the sidelines Lindell said the following. The Bills offense got the ball back at their own 30 on the ensuing possession with 9:05 left in the game following the Powell punt and defensive stop by Buffalo, but went three-and-out. On Sunday Chan Gailey chose to pass on a 52-yard field goal attempt in the second quarter to punt and pin Indianapolis deep. The Colts were able to drive the length of the field however, and get a field goal of their own in the 20-13 defeat for Buffalo. It was very similar to another punting decision back in Week 6 at Arizona. In overtime against Arizona facing a 4th-and-10 at the Cardinals 35-yard line the Bills chose to pass on a 53-yard field goal attempt and punt. Shawn Powell punted into the end zone. Jairus Byrd did make the game-clinching interception on that ensuing Arizona drive to seal the win. Here was coach Gailey’s take on his decision Sunday. Both of those games this season took place indoors. Rian Lindell in his Buffalo career has just one 50-plus yard field goal attempt indoors. It was on Oct. 15, 2006 at Detroit and Lindell was good on a 53-yard attempt. When asked about Lindell’s range indoors Gailey indicated they were right on the edge of it. For his career, Lindell is 11-21 on 50-plus yard field goal attempts (52.4%). A day after the release of Brian Moorman players admitted the move caught them completely off guard. Veteran players on the roster that had been a teammate of Moorman for multiple seasons had trouble understanding the move. Kelsay found out on Tuesday afternoon. He was at One Bills Drive and ran into Moorman, who had just been delivered the news of his release by GM Buddy Nix. Chan Gailey indicated that it was a difficult decision that they talked about. He pointed chiefly to consistency in Moorman’s game. He’s not exactly the Maytag repairman. Bills kicker Rian Lindell has hit all nine of his PAT attempts this year. But Lindell has not attempted a field goal so far this season, the only kicker in the NFL to not try a three-pointer after two games. That’s the upside. The Bills are a perfect 5-for-5 on their red zone possessions so far this season–five trips into the red zone–five touchdowns. Lindell says he’ll take that, and the victories, all year long. Do you know if we will ever get a graphic on our scoreboard every time Mario Williams gets a sack like Houston used to do for him (check it out on youtube)? I’m not saying it’d have to be as elaborate, but it’d really get the fans pumped when he, or any of our staunch D-linemen get a sack. CB: From what I understand there are some plans in the works for something like that, but I don’t know when it will be unveiled. In seeing the success of (K) John Potter in the preseason, and the talent he has in being able to kick touch-backs consistently, I can’t say that I would disagree with Chan Gailey opting to make him a permanent fixture on the special teams for kick-offs. We’ve all discussed the pro’s: less injuries, saving Rian Lindell from tackles/block action, no huge returns, field position…etc. The pro’s greatly outweigh the discussed ‘con’ of giving up one of the 53-man roster spots. However, in watching the preseason games, I feel like this will effect Rian Lindell more then people are discussing. Wouldn’t you think that kick-offs are a large part in allowing kickers to stay loose and confident for when the time comes in a game for a longer field goal? I’m worried that Lindell might have a rougher go this season due to a change in his routine. Do you think that is a valid concern? CB: You might be over thinking it a bit. By not having to do kickoffs, which require a different technique (i.e. kick for hang time) he’s now only really kicking one way (for FGs). With Potter handling kickoffs it will save his leg, thereby making long range kicks more realistic and allow him to focus on kicking one way all the time. Will the Bills use Dorin Dickerson as an extra receiver in the four wide receiver sets? What I saw of him on the training camp clips, he is a very valuable weapon in the passing game. CB: I think the Bills coaching staff sees him as a mismatch in the passing game. He’ll most likely be used as an H-back in Buffalo’s offense. However, I think his role in the game plan will be largely dependent upon the opponent each week. But yes, I would anticipate seeing him as a guy split wide at times, or motioning before the snap. Who is the funniest player in the Bills locker room?? Or maybe give me the top two… Thanks for all you do! CB: I don’t really witness a whole lot of joking around among the players, but I will say that Fred Jackson and Nick Barnett are notorious pranksters always pulling stuff on their teammates. 5 – Why do they call George Wilson ‘The Senator’? CB: George Wilson got this nickname from the media, mainly because he is such a good quote. Journalists often look to reliable, quotable players to provide an accurate pulse of the team, a poignant comment on a teammate or a worthwhile perspective on any football topic. George does that. Sometimes his answers are long, but they’re worth it and at times his answers have a style that would fit in the political arena. I believe it was the Buffalo News’ Jerry Sullivan that first dubbed him ‘The Senator’ and it stuck. The combination of Rian Lindell and Brian Moorman in Buffalo’s kicking game is entering it’s 10th season. After working off one another for as long as they have, there are continuity benefits that keep each of them sharp. Lindell and Moorman are just two of four players on Buffalo’s roster entering their 10th training camp or more with the Bills. For Moorman it’s his 12th. Rian Lindell is rarely satisfied with his own performance in games, which is why entering his 10th training camp with the Bills he’s still striving to improve. Of course the presence of seventh-round pick and kickoff specialist John Potter is an added incentive to be at his best. What Lindell has under his arm however, is a new long term contract, which one would think provides at least a bit of insurance in Lindell’s mind. Lindell said until this team makes the playoffs, he’s always going to believe there’s more he can do. New tight ends coach Pete Metzelaars and newly re-signed kicker Rian Lindell will both be on the radio airwaves Wednesday morning. Here’s where you can find them. You can also listen to the Bills new flagship station (WGR Sportsradio 550) on the Bills mobile app. Here is our exclusive 1-on-1 interview with Rian Lindell just minutes after he signed his new multi-year contract with the Bills late Tuesday morning. 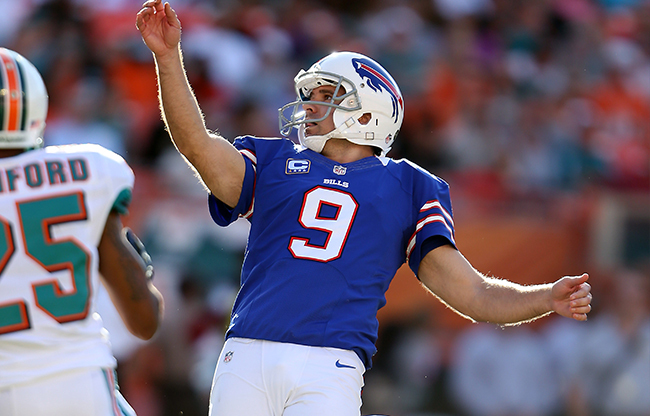 Bills kicker Rian Lindell has a brand new contract as he re-upped with Buffalo Tuesday. He also now stands a good chance of setting a brand new franchise record. With 878 points in a Bills uniform Lindell is in striking distance of Steve Christie’s franchise scoring record of 1,011 points. Not counting this past season in which he played in just eight games, Lindell has averaged almost 102 points a season (101.75) over the last eight years. Just 133 points behind Christie, if Lindell stays healthy he should pass Christie for first place on the all-time scoring list come the middle of the 2013 season. Lindell already holds the team record for career FG percentage (82.93%), consecutive PATs (225), single-season field goal percentage (92%, 2006) and consecutive field goals made (18). By the time the season is over Dave Rayner will have spent half a season with the Bills, giving him a lengthy opportunity to convince the coaching staff that he’s deserving of consideration to be the team’s kicker beyond the 2011 season. Head coach Chan Gailey admitted between Rayner and reliable veteran Rian Lindell it won’t be an easy call. Both Rayner and Lindell are unrestricted free agents after this season. Lindell is the most accurate kicker in team history.